Working out on a recumbent bike can be quite boring. And that's too bad, because a recumbent can be a good option for you if you have back problems or if you suffer from joint pain. But that's also one of the reasons that the Schwinn 270 recumbent bike is one of the more popular models today. Its got a long list of features that are meant to make your workout, just a bit more enjoyable. And today we're doing a full review of it. So without any further delay, let's start. The Schwinn 270 recumbent bike (MY17) is a well built piece of equipment. Schwinn took something that already proved to be working, (the old 270) and upgraded it so that it will fit modern use capabilities. That's because, as you might know already, working out on a recumbent bike can be quite boring. But with it's Bluetooth connectivity to track your live stats with various fitness apps, the media rack, and with the mixed reality bike riding with a social riding app, you're able to turn your workout session to something you're actually looking for. And despite it having a lightweight flywheel, with its 25 magnetic based resistance levels, and its 29 workout programs, this bike can provide a highly effective workout. Bottom line is, the Schwinn 270 recumbent bike is a well built bike that can help you achieve all sorts of fitness goals, all while keeping you entertained as your exercise. There are several reasons you should go for a recumbent bike in general. That is, besides of the obvious fact that you'll get the option to workout in your own home. First of all, a recumbent, in contrast to a spin/upright bike, can provide a cycling exercise with less pressure on your back. In addition, if you suffer from joint pain, and you avoid doing any cycling activity because of that, a recumbent can help with that too. Since there is little to no pressure on your legs and knees, you'll most likely be able to pedal without feeling pain. You can read more about the subject in our best recumbent bike guide. And cycling regularly can help you in so many ways that I can write an entire series of articles about it. Cycling can do wonders to your body and soul. So as long as you can, cycle away 3-5 times a week for 30-45 minutes each time. In contrast to spin bikes, recumbent bikes can't provide high intensity workout. You're not able to stand and pedal on them, and unfortunately, they don't quite simulate a real road bike cycling. Which some spin bikes can. Furthermore, they take up more room than spin bikes or upright bikes. If you're interested to learn more about spin bikes, check out our recommended 13 best spin bikes for home use. In short, the Schwinn 270 is an electric-powered recumbent bike, and the MY17 is the new version of the 270, which we're reviewing here. It supposed to be the new, more sophisticated, upgraded, version of the old 270. That, in my opinion, did lack some vital features. It's got a sturdy build to it, and it actually does provide a quite workout experience. In addition, it makes tracking your progress a lot easier, by integrating some cool features that will help you do so. But above all, when compered to it's direct competitors, like the Schwinn 230, or the Nautilus R616, the 270 stays in front of them, all while keeping its price at a decent level. Finally, this recumbent bike might be a good choice especially for people who have back problems, or suffer from joint pain. The 270 has some very cool features, and it is certainly an upgrade compared to the 230. But since size and overall design is a major factor in my books, let's do a quick overview of it's size, before we'll drill down it's features. First of all, and I hope it goes without saying, check what is the available space in your future to be spot for this bike. Make sure your space have extra 15 to 25", in addition to the bike's measurements, from all sides. That's for convenience and safety purposes. The 270 is 62.5" long (158 cm) 26.6" wide (67 cm) and is 52.5" (133 cm) tall. Therefore, the proper footprint in your soon to be spot for this bike should be: 72.5" long and 36.6 wide. How does the 270 stand, size wise against other recumbent bikes, mainly, its direct competitors? Well the Schwinn 230 is 64" long (162 cm) and 27.7" wide (70 cm). And the Nautilus R614 is 65.3" in length (165 cm) and 28.3" in width (71 cm). As you can see, the footprint difference is not that significant. Though the Schwinn 270 does have the smallest footprint. However, this also make it not so comfortable for people over 6'3, or with an inseam of over 35. So if you're one of them, keep that in mind, and I suggest you look for a longer recumbent bike. The soft-spot of this bike is probably its flywheel. Weighting just 13 lbs, it's not the heaviest of flywheels out there. However, if you're not the most active person, or you're not planning on doing high intense workouts, this shouldn't be a problem for you. The flywheel is paired with a magnetic resistance system that offers 25 levels. This is slightly higher than the 20 that the 230 offers, and a lot higher than the 8 that the A20 offers. So while it's true that the flywheel is not very heavy, I don't see myself, for example, pedaling my worries away on level 20. And I'm an extremely active person. One thing that can be said about Schwinn is that they know how to built their products. And the 270 is no exceptional. Compared to other recumbent bikes, the 270 is not that heavy. Weighting only 86.6 lbs (39 kg) (thank's mainly to its lightweight flywheel) the 270 is still able to support a max user weight of 300 lbs. And it can support such weight thanks to the solid steel frame and tubing. This is great for people who want to start getting in shape, but are shy to do so outdoors. The solid tube construction is also what makes this bike a very sturdy one. You do however, need to make sure you assemble it correctly and that there are no loose parts. 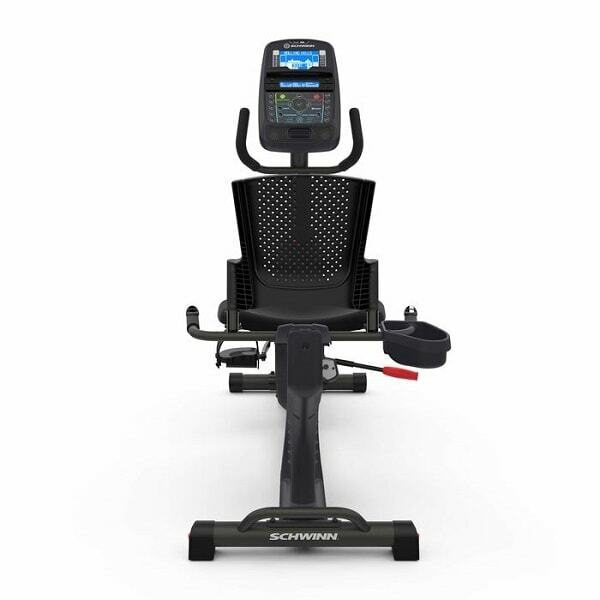 Unlike it's predecessor, or for example the Schwinn 430 Elliptical, the 270 has a Bluetooth connectivity feature. Having a Bluetooth option can make your life a lot easier when it comes to tracking your progress. In previous models you had to download all your workout stats to a DOK, and then manually upload it to the supported fitness app/trackers. Now with Bluetooth, it's a lot easier to keep track of your goals, weekly progress, see personal records and so much more. I gotta say that having the ability to track your progress can help you stay focused and on target. You can download the Schwinn fitness app to your phone here: APP STORE | PLAY STORE. In addition, you can also connect the Schwinn app to the MyFitnessPal app, and sync your workout information. The total number of workout programs in the Schwinn 270 is 29. 4 of the them you can set as you please. There are also 12 preset profiles which are meant to simulate cycling on different locations and conditions. Like on rolling hills, ride in the park, pyramids and more. When using any of these 12 programs, the bike will automatically adjust the resistance and the overall workout level. In addition to those 12 programs, there are 9 programs for heart rate control. In simple words, you'll have to set a heart rate target for the workout, and the bike will adjust everything in order for you to reach that target and maintain it through out the workout. This can help when you want to take your heart to it's fat burning zone and keep it there. There are also 2 programs that will test your fitness level. These 2 check the improvement of your fitness level. And they do so by comparing your power output to your heart rate, as well as the age and weight of the selected user profile. The idea is that, as your fitness level improves over time, you will spend less power at a given heart rate. It can make knowing where you stand, fitness wise, as you progress a lot easier. In my opinion, the new console Schwinn designed for it's new models is way more beautiful than the old one. Its got more modern lines and finish to it, and the overall design is silk. The console is where you'll orchestrate over the features of this bike. It used to be when bikes had a knob to adjust the resistance, and another handle to adjust the incline, and so on. On the Schwinn 270 you can operate all these important features right from the console. Which is great, simply because it makes operating it way more easy. However, when you first look at the console, you might get a bit overwhelmed from all of the buttons and options. Despite being packed with fancy buttons, learning how to operate all the options is quite easy. And if you're a self learner, you can easily learn how to use it without reading the user manual. Schwinn came to the obvious conclusion that not every one that buys this model will place it in front of the TV. That's why they added the media rack. On the media rack you can place your phone or tablet, and even a magazine if you're more into reading. Right above the media rack there's a USB charging port. Nice thinking from Schwinn, because you're able to charge your device while you watch your favorite TV show on it. One of my favorite parts about the console is the dual track display that Schwinn oh so love. In short there are two displays on this recumbent bike. Main one, and a secondary. Basically, the main display is where you get an overall info about your workout setting and goals. The second display is helpful in two ways. First of all, having two displays prevent overload of info and numbers on one huge display, which might make tracking stats difficult. In addition, if you have your tablet on the media rack you can't see the main display because your tablet is blocking it. The seat of the Schwinn 270 sits on a slightly angled aluminum made rail system. Adjusting the seat is quite easy, but you can only adjust it forward and backwards. Unfortunately, there are no number marks on the aluminum rail, so you would have to manually mark your seating position. That's in case there are other people in the house using the bike, and each one has it's own seating position. Furthermore, the seat of the 270 is quite comfortable. It's got a ventilated backrest that provides fairly nice lumber support. But, I'm afraid that a workout session of over 45 minutes will take its toll on your tush. On the other hand, you can always place another layer of cushioning to the seat. In addition to the Bluetooth connectivity, the Schwinn 270 has a USB port. The main use of it is to enable you to charge your smart device while you use it on the bike. This way, your tablet won't run out of juice while you watch your favorite show on Netflix. In addition, you can also download all your workout data to a DOK, and upload it manually to the Schwinn Trainer app. You might ask yourself why do you need to use a USB when you have the option to sync all the stats via Bluetooth. My guess is that since it is a feature that dates back to old models, Schwinn had decided to leave along side with the Bluetooth. It's up to you to decide which one you want to use. One of the most important workout metrics, is the bpm's of your heart. With a heart rate monitor you can tell if you're working hard enough, or, working too hard and you might need to cool yourself. On the Schwinn 270 the heart rate monitor is used in several ways. First, as I already said, there are 9 dedicated heart rate control programs. in addition, your heart rate stats are saved and synced with the fitness apps, as its being saved with the rest of your workout stats. Furthermore, each user has it's own heart rate zone in the bikes memory. This way you can set for yourself a general workout guide for a certain heart rate zone for specific type of workouts, like, aerobic, fat burning, or anaerobic. So for example, if you're after burning fat, you can use the heart rate monitor to know if you're entering your body's fat burn zone. Simply by increasing your heart rate to the proper zone. Keep in mind though, the graph used in this bike is a general one. So you'll have to consult a personal physician to get one that is right for you. Nevertheless, it's still a cool function. And finally, I must add a personal note. I wouldn't put too much trust on any heart rate monitor of any indoor bike, as most of them are not very accurate. However, you can use a heart rate chest strap. Just make sure it operates at 4.5 kHz - 5.5 kHz range, and that its uncoded from Polar Electro. In addition you can also use an uncoded Polar compatible model. One especially recommended item is the Polar T31 Non-Coded Transmitter. I think that one of the coolest features is the integration with the RideSocial app. In short, RideSocial is an app that simulates cycling in different locations like, Santa Monica, Death Valley, Swiss Alps and more. But the really cool option is that you can "ride" live together with a friend. As long as you both have the app of course. In addition, the app also tracks your real time workout stats, since it is officially compatible with the Schwinn 270. This is such a cool feature in my opinion, simply because it can add a realistic dimension to the workout. In addition to all of the above, you'll also find a pair of speakers on the Schwinn 270. The speakers are located in the lower part of the console. They can produce a nice listening experience, and the quality is more than decent. But don't expect any boombox like volume or anything like it. The speakers work when you connect your media, may it be MP3 player, phone, tablet, etc, with an aux cable to the headphone jack. And finally, there's an adjustable fan which has 3 speed levels and is located right between the speakers. You must know that a fan on a recumbent bike is not meant to blow your hair while you workout. That's due to it's small size. However, a fan can help cool you down a bit, thus making your workout a bit more bearable. Which make it an important feature, specifically for elderly users who tend to pick up a sweat a bit too soon. The main competitors of the Schwinn 270 are it's little brother, the 230, the Nautilus R614, and the Nautilus R616. The Schwinn 230 is a bit cheaper than the 270, but it doesn't have a long list of features like it. It's got only 20 level of magnetic based resistance, and 22 workout programs. No Bluetooth ability, or the option to use a heart rate chest strap, or the ability to track your live workout stats in any fitness app. However, it does come with the dual track display (No Backlit), USB port, media rack, and a set of speakers. The Nautilus R614 is more expensive than the Schwinn 230, but it is still cheaper than the 270. Not by much, but still, if you can save a buck, then why not. It's also got 20 levels of magnetic based resistance, and 22 workout programs. Dual track display (No Backlit), USB port, media rack and two speakers are also included. But, there's no Bluetooth connectivity, or support for heart rate chest strap. And again, you can only track your live workout stats on the console of the bike, since the R614 is not able to sync live with any fitness app. So, the Nautilus R616 is the most expensive out of the three alternatives. And it's also more expensive than the Schwinn 270. However, it can stand up to it quite nicely. Like the 270, the Nautilus R616 feature 25 levels of magnetic based resistance, 29 workout programs, Bluetooth connectivity, live syncing of workout stats to fitness apps, and more. The Schwinn 270 recumbent bike might be a smart choice for you, if you're looking for a bike that deliverers low impact workout. That's due to the natural nature of recumbent bikes. That's just what they are meant to deliver. Schwinn didn't tried to reinvent the wheel when they upgraded the 270. It's got all the that we liked from the old model, plus a set of new features that are more up to date. Like the Bluetooth connectivity, the ability to easily track your workout stats and progress, not only on the bike, but also with compatible apps. It packs a long list of features that are actually meant to spice your workout, and to turn your it into something you're actually looking forward to. However, I feel that if further slight adjustment would've been made, then it would have probably become the ultimate recumbent bike. Adjustments like, increasing its length a bit so that can fit taller users, or providing a more accurate heart rate reading, so that I won't have to buy a heart rate chest strap. But, it is probably still, in my opinion, the best recumbent bike for its price level.